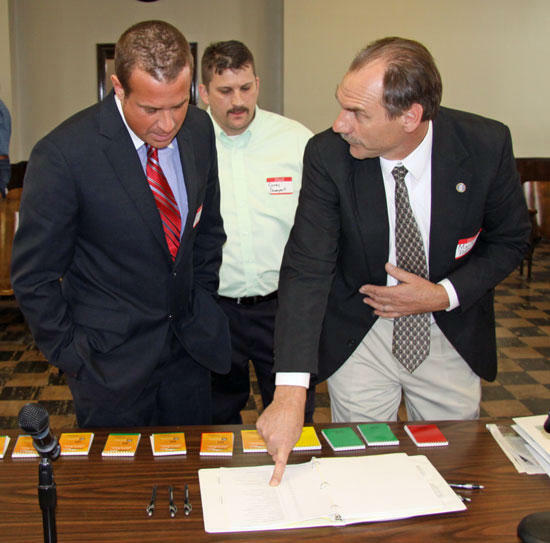 State Rep. Mark Pody, far right, discusses city code regulations with Marcus Bowling, left, and Corey Davenport, center, during the Cannon County Business Forum April 7. I waited a few days before I wrote this letter because of the frustration I felt as a citizen of Cannon County specifically in the lack of response and total disregard to the duties of the members of the Cannon County Commission and other elected officials that did not attend the business forum that was held on April 7th, 2011 at the Courthouse. So that all of you can better understand the notice and effort that was given to try to ensure as many of our elected officials could attend the meeting on April 7th, I want to give you some facts. Thirty letters of invite were sent out on March 5th thirty two (32) days in advance of the meeting. In the letter there were two telephone numbers provided to R.S.V.P. in the event the person could not make the meeting. I had one person out of all those invites who took the time to call and explain why they would not be there and that was Vice-Mayor Charlie Harrell. The basic agenda for the meeting was provided in the invitation along with the main speakers who would be in attendance (State Senator Mae Beavers and our State Representative Mark Pody). In addition to them, we also had in attendance a representative from Congresswoman Dianne Black’s office and Don Rigsby who is a specialist with the Tennessee Department of Economic & Community Development covering Cannon County. The meeting was advertised on the Cannon Courier website and an article was written in the Cannon Courier, along with a paid advertisement reminding everyone of the meeting. The day of the meeting, WBRY Radio Station was kind enough to remind the listeners of the upcoming meeting throughout the day. The meeting was an eye opener to say the least. The main topic was to inform the public on what our current plan to bring new industry and business to Cannon County is and what we can do to make it better and help create much needed jobs and tax revenue for our community. Tax revenue is the key to building new schools, paving roads, providing basic services all over the county and is desperately needed in these tough economic times. Property taxes and the Wheel Tax are funding most of our services today. The goal of this meeting was to find ways to create new industry in order to offset those taxes and to create jobs. Tourism was discussed and how we could improve marketing Cannon County in a positive way to draw outside dollars to support our local businesses when people come and “eat a meal and buy a tank of gas” while visiting the Moonlight Drive -In, the Good Ole Days, and the best “one night horseshow in the State of Tennessee”, or the Arts Center to name a few. At the end of the meeting I was told the Chamber of Commerce only receives $50.00 a year from the county and the support for marketing is simply not there. When comparing other counties five year plans to ours, it is easy to see why we fail. 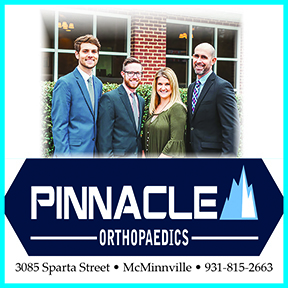 Other surrounding counties have plans with similar goals as ours, with people assigned to accomplish them and a dedicated time frame to get those goals completed. Ours is a good read, if you need something to put you to sleep at night. And I say that with no intent to disrespect the people who helped create our plan because the plan itself could be a good one. However what good are plans when you have no intention of following through with any of them? Blueprints to build a house are necessary, but if you never dig the foundation or lay the block then they are not worth the paper they are printed on. The power to begin change on all of those issues lies within the scope of the County Commissioners. They are the ones who make the decisions that will either change the road we are on or continue to drive us down the one we are currently on. I lost faith in their desire to change or help by the lack of them in attendance. I have heard one of them was at another meeting, some were supposed to be working and one was attending a funeral, the latter is very understandable. However, I do question the choices of all of the Commissioners who did not have a family emergency on not attending this meeting when it concerned so many different people, in so many different ways and has such an impact on the lives of the very citizens who voted them into office when they had over thirty days to make other arrangements. It was especially disappointing considering we had members of our State government there to help us learn what we could do to help them help us. Perhaps had this meeting been about something as “important” as removing the powers of the Constable instead of creating jobs then maybe we would have had all ten in attendance. Whether you agree or disagree with that decision does not matter to me. However, when more focus and time is spent on something like that versus creating jobs I question the integrity and decision making ability of the Commissioners. I sincerely believe in the idea that every citizen should help their local government create a better community for everyone to live in. I tried very hard to do just that. A lot of effort was put into this meeting from a lot of different people. Having two out of ten Commissioners in attendance was an embarrassment to this county and a total disregard to the citizens of Cannon County. We were all told during the meeting by Representative Pody and Mr. Risgby that Cannon County is NOT ready to bring new jobs or new industry to our area because we have NOTHING to offer a business even if it was willing to locate here. That will always be true as long as we have leaders who are apathetic to the problems we face and more concerned about egos and matters that affect five citizens instead of the thousands in Cannon County. I want to specifically thank Commissioners Tony Neal and Russell Reed who decided that being a Commissioner and representing the people who elected them was a serious job and attended the meeting. I would also like to thank those who did attend from the City of Woodbury to include Mayor Harold Patrick and several Alderperson’s. There were also Alderperson’s representing Auburntown as well. Sheriff Darrell Young was also present and I appreciate County Executive Mike Gannon for his input during the meeting. For those of you who attended that I have not mentioned, you were greatly appreciated also. I invite you all to go to the link: http://vimeo.com/22294115 and view the meeting for yourself. It was recorded to help give you an idea of what we face and why we face it. Corey, I could not agree with with you that more Commissioners should have been present. However, Representative Pody says Cannon County is "NOT" ready to bring new jobs or industry. Does he offer advice or assistance? Does he provide his office staff to help? I can not imagine or know of a time when Stratton Boone would tell the people of Cannon County that we were "NOT" ready for jobs. Perhaps these speakers are not worth the commissioners or my time! How about a plan for the next state election! ncstl the reason Mark Pody and Don Rigsby said we were not ready was because we have no buildings to offer any new industry, we have no land sites ready to build on and our five year plan has no one assigned to accomplish any of the goals it sets out. We have one chance to impress new industry. There are 94 other counties in Tennessee that want them as well. Most of those counties can look at an industry and say "here is our new building", "here is available land", "and here are tax incentives we have to offer". Cannon County can't do those things. If you were a business owner and you had the opportunity to go to a county where they had everything set up for you to move in or you could come here, which would you do? That is the reality and competition we face across this state. The reason Stratton Bone never said we weren't ready for industry in Cannon County is because people didn't want him to say that. I am glad Mark puts that out there because hiding behind the idea we are ready is misleading to put it nicely. I am not going to make this a Stratton vs. Mark conversation, but I do know for a fact Mark has been in touch with our county officials trying to bring jobs to our community on several different occasions and has made it extremely clear he will help us in any way. I also believe Don Rigsby to be very well edecuated on the subject of us not being ready for industry considering that is his job and his is not one that is either Democrat or Republican. If you have someone who works with counties every day say you are not ready, you need to pay attention and find out why. And more importantly ncstl, this has nothing to do with the State election, this has everything to do with your local elections. Democrat or Republican in the State level cannot do anything without the support of the local officials and it was plain to see we had very little. And the caption above is not correct with the picture. Mark was explaining the current business plan we have vs. other county plans and how much difference there is between the ones that actually plan for growth vs. ours. Cannon county can not entice industry to this county when there are no sewer lines to support industry. You can't run a factory of any size on a septic tank. Our current industrial park is in a flood plain, and no planning for the future. From what I am getting, Representative Pody who said that Cannon County is NOT ready to bring new jobs or industry is because our Commissioners are not ready. If our own Commissioners didn't bother to come to the meeting then how are they willing to bring new jobs and/or industries to our county. If the commissioners came to the meeting then maybe just maybe help would have been offered. It would have been nice if more commissioners and aldermen attended the forum, but anyone who would criticize them for not doing so might want to examine their own level of community involvement. How many meetings of the commissioners and aldermen have they attended in the last two years? Have they been at meetings of the industrial and economic development boards to put forth their ideas? Have they volunteered to serve on those boards? Do they volunteer to serve on any of the various county commission committees which deal with economic development? Are they members of the Chamber of Commerce? Are they involved in the Three-Star Program? I think Neal Appelbaum put it best when he said in a Letter To The Editor last week that the first step is to listen. In order to do that, one has to be there. Well Kevin I am not one who thinks a person should toot their own horn and I am not someone who believes in letting everyone know what I have done or what I am doing. I think actions speak a lot louder than words, but since you seem to think I should examine my own level of community involvement I will. For the record, over the last 15 years I have quietly help secure grants I estimate totaling over $50,000 for the schools, the Dixie Youth Program, The Reach Program and the Senior Citizens Center. Several of those grants totaled $10,000 each and you or anyone else is welcome to confirm that. I have helped secure a piano for one of the schools here in Cannon County at no cost and volunteered to coach Jr. Pro basketball and Dixie Youth baseball through out the years and have been a counsler at Short Mountain Bible camp at different times. I have also been a very strong advocate for Cannon County anywhere I go. At no time did I expect anything in return for those things. I enjoyed doing them and hope to continue to do more in the future. Just because someone does not attend the "Commissioners meeting" does not mean they are not up to date with what is going on or they are not involved in the community. The way the commissioners meet every three months makes it difficult for people to attend because if they miss one meeting then the total time could be 6 monthsin before they are seen again. Also they last sometimes four hours because they have 15 items listed under the "other" category that no one ever seems to know about. People don't always have time to set through a meeting like that. Just so you know, I have talked with four different commissioners over the last few months about various topics. Three of them face to face and one on the telephone. Two of them I have been in contact with via email and Facebook over the last few weeks. In the end, the meeting on April 7th that I helped coordinate was done by citizens like me and not by the commissioners, which should have been the ideal way. Everything they needed was there for them. Everyone they should have been talking to was there for them. The only thing more I can think of I could have done to get them there would have been renting a van and driving by their house and picking them up. I think you forget they are the ones elected. They chose to run and say to the people I want to lead you and help you. They are the ones who are paid to do the job. I agree that everyone should help and be involved. I have been on record as saying that for years. I also agree with Neil that the first step is to listen. I did listen. I listened to the silence of eight County Commissioners who chose not to say anything by choosing not to come to the meeting. I think that silence speaks volumes toward the true attitude of the leaders we have running this county. Your last sentence was "In order to do that, one has to be there". That same statement applies to the Commissioners as well! Excellent article. I am one of those individuals who ran for county commissioner. I continue to be a believer the people spoke loud and clear on election day making their position known. Until we come back to the reality of the business at hand Cannon County will continue to suffer with its poverty ideas. You get what you vote for. Until the people of this county embrace change and new ideas that will enrich this town for the better with good jobs and industry we will remain a county with poverty ideas.